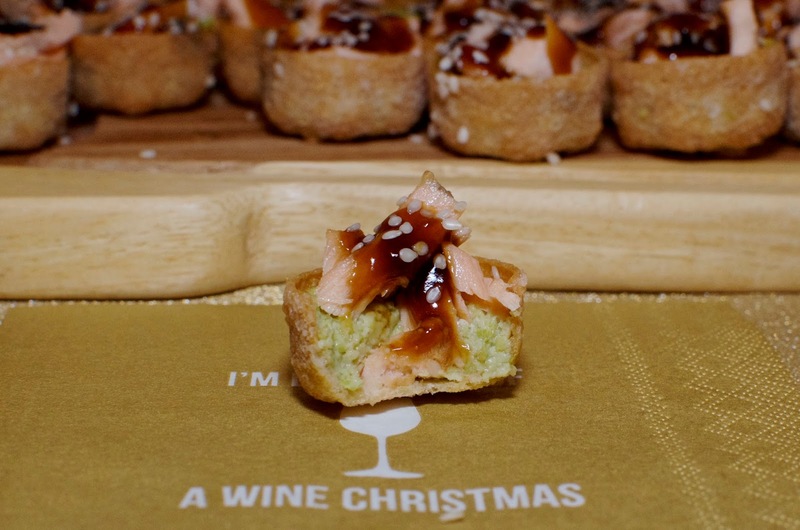 Teriyaki salmon is one of my favorite dishes, so I wanted to recreate it in tiny, party food form for the holiday season because it's one of those meals with flavors that I think most people enjoy on some level. 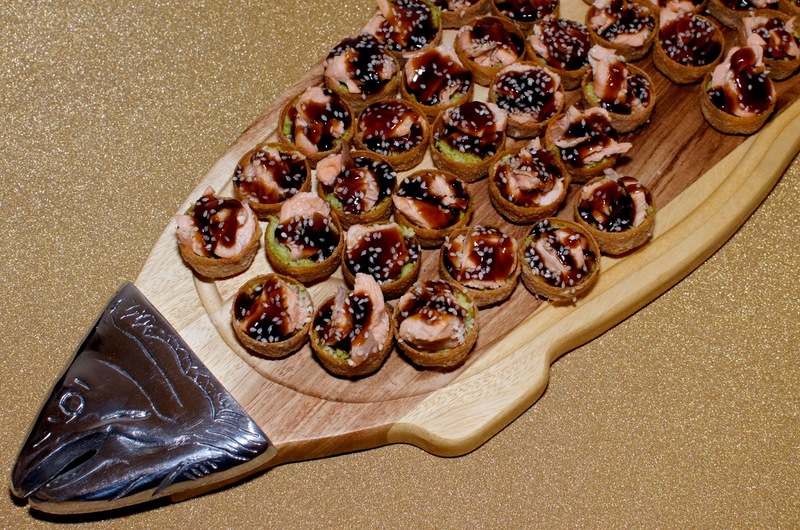 I've rarely ever met someone who doesn't like the salty sweetness of teriyaki sauce, so in general, it's a crowd pleaser, which makes it perfect for party food when you're trying to provide nibbles for the masses. These little cases are compact, not terribly messy and delicious. The croustade case gives them a new life, adding the cruchiness of pastry. If you don't want to buy croustade cases, you can make your own or substitute them with filo pastry cases that are easily made or purchased this time of year as well. You could probably even amend this to work with crostini if you liked by making sure your sauce is thick enough not to run all over the beautiful cocktail dresses and freshly pressed suits of your guests. Just remember, whatever cases you make or buy, your quantities may vary if they are larger or smaller. If you're making cases of your own, you'll get the appropriate size by using a mini muffin tin to shape the cases rather than a regular sized one which will make the cases much larger and therefore not only decrease the quantity, but also make these a little harder to eat without cutlery. Should you find yourself entertaining vegetarians alongside the others on your guest list, simply omit the fish from some of the canapés and replace it with tofu or get creative with another option. Presenting these is super easy as they are colorful and inviting as they are. 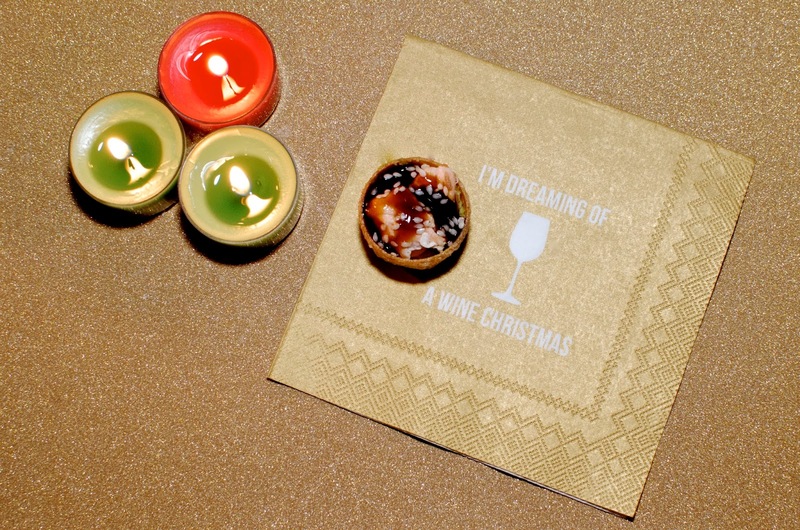 Displaying them on a silver tray, a wooden board or even a festive holiday plate or tray alongside some cute cocktail napkins will work perfectly. I simply couldn't resist serving these on the KitchenCraft Master Class Gourmet Prep & Serve Acacia Wood & Metal Fish Serving Board. What I love about this board is that you can do anything with it and it's so cute! You can use it as a cutting board or a serving board, but equally it's great for prepping and taking straight to the table. 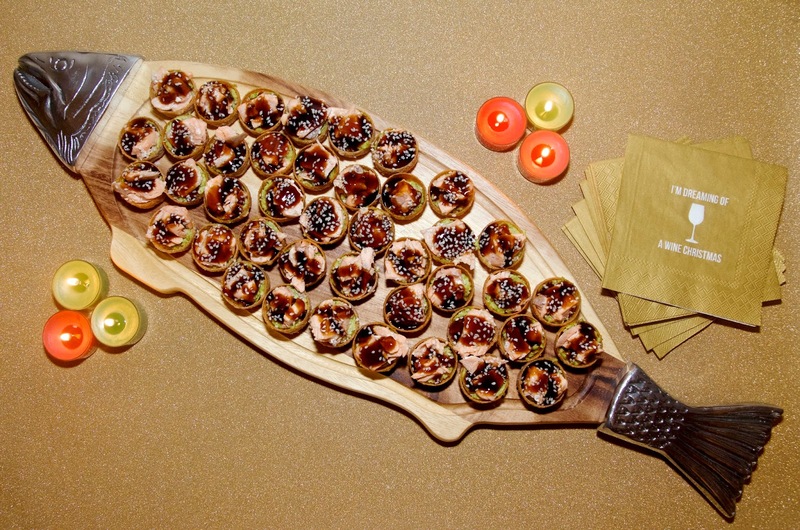 While I'll admit that it's not entirely Christmassy, it's perfectly fun for serving fishy nibbles at a holiday or other type of party and it's not something that has to go into storage immediately following the New Year. 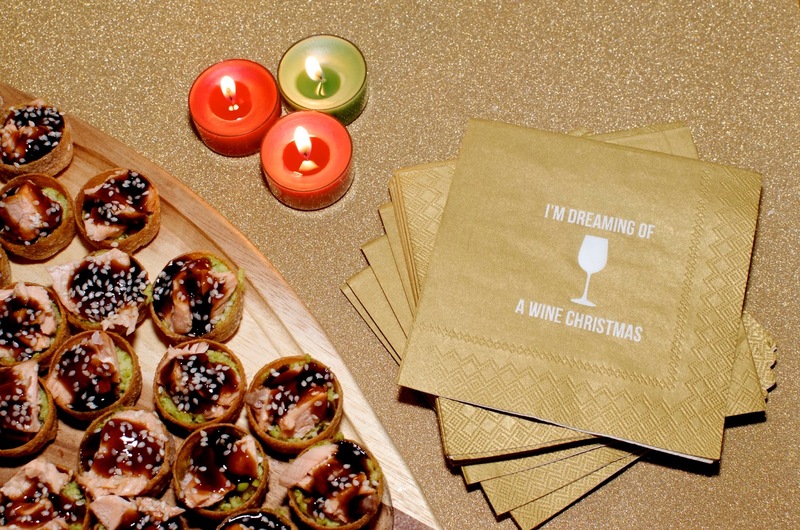 This adorable board will be a staple at my parties, dinners and private meals all year round whether I'm serving finger foods or meats & cheeses. One final note... While these may look complicated and the recipe below may seem lengthy, I'd love to encourage you by saying that it's not at all difficult or terribly time consuming. I generally turn out 48 of these in less than an hour of total time, often working in steps rather than doing these all in one go. The fish, purée and sauce can all be prepared well in advance. If you're prepping them the day before, simply store them in the fridge and allow them to come to room temperature before serving. The sesame seeds can also be toasted in advance and stored in an airtight container. If you find that your sauce is a little like jelly when you take it out of the fridge, simply heat it up lightly on the stove or in the microwave until it's warm, but not hot and it will thin out a little, similarly to gravy. Considering the amount of this recipe that can be done in advance, it's super easy to put these together while hosting a cocktail or dinner party, so they're a bit of a lifesaver, but your guests will take one look and think you slaved away in the kitchen all day! * Makes 48 bite sized croustades when using pre-made croustade cases - quantity may vary if different cases are made or used. 1. Begin by steaming or poaching the salmon fillets. When they are fully cooked remove them to a plate to cool. 2. 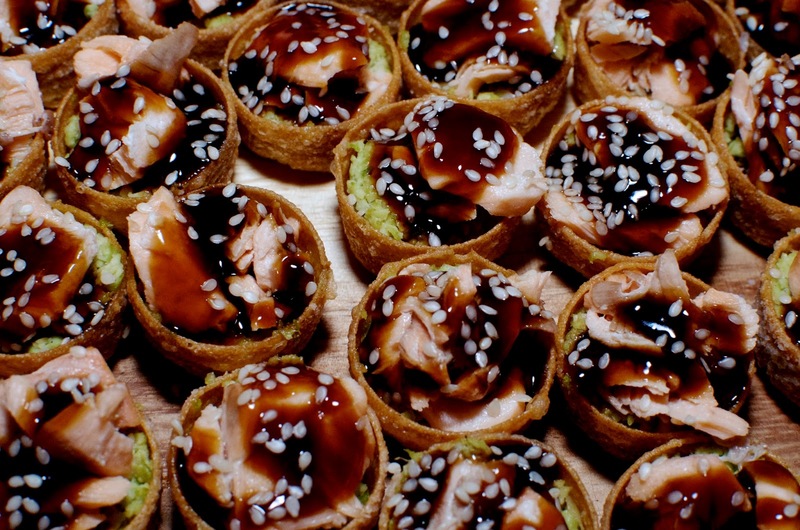 While the salmon is cooking, you can get on with making the other components of the canapés. Start by preparing the croustade cases. Place them on a baking sheet, large cutting board or other flat surface you can use that you don't mind getting messy. To keep them crispy you can either brush them with butter, or I prefer for this recipe, using garlic oil. Either works just fine. When you've brushed every case, set them aside and move on to the fillings. 3. Make the teriyaki sauce by adding the water and the brown sugar to a small sauce pan, cooking on medium heat. Dissolve the sugar completely and bring to the boil allowing it to bubble away for a minute or so before adding the other ingredients. 4. Add the mirin and soy sauce and boil for another minute or two, stirring lightly occasionally. 5. Remove about 1/4 cup of the liquid and set aside for the edamame purée and then proceed with thickening the sauce. To do this, add the two tablespoons of cornstarch (corn flour) to a bowl and mix with a little bit of cold water with a wire whisk until a slightly wet, smooth paste. If you don't get this consistency quite right, don't panic. The most important thing is that it's smooth and not lumpy. Pour this a little at a time into the bubbling sauce, stirring with a wire whisk as you go giving it a few seconds before adding more to thicken until you get the consistency you're after, which is that of glaze. Keep in mind that the sauce will thicken further upon cooling, so when in doubt, err on the side of runny. You can always heat it up again later and add more cornstarch if needed, but if you get it too thick, it will turn into a sort of jelly and not only will it be harder to work with, it also won't look too appealing. 6. Once you've added the cornstarch and achieved the consistency of a glaze, remove the sauce from the heat, set aside to cool and move on to the edamame purée. 8. When you have your fillings ready, one last step before assembly is to quickly toast some sesame seeds in a dry frying pan, taking care not to burn them by tossing and stirring them over low to medium-low heat. You'll know they're toasted when they start to give off an aroma, color slightly or if you're nervous, simply do it until they are warm to the touch. Once toasted to satisfaction, remove them from the heat immediately onto a plate to cool. In terms of measurement, I've not provided one here - you can simply use your judgement, but you want enough for at least a light sprinkling over each canapé, but you can go nuts if you prefer more seeds or hold back if you like a little less. 9. Now you can assemble your croustades. Start by mushing a small spoon of the edamame purée into each case. You should have enough to fill each case about 1/2 or 3/4 full. It's totally fine to do a little in each case and top up with what's left afterwards. Be sure to mush it down into the cases so that you have space for the other fillings. 10. Next, flake the salmon with a fork or your fingers. It doesn't need to be at all perfect and there's no specific size requirement. You simply want enough to put a small piece or two into each cup and again, you can start with a small amount in each and top up when you're finished with what's left. There will be plenty enough for each croustade. 11. Next comes the sauce. You can drizzle this with a spoon, pour it from a jug or use my method, which is to put it into one of those plastic accordion style cake icing pipers or a squeeze bottle. Drizzle a little sauce over each canapé. You will likely have about half leftover, so don't feel like you need to use it all. You can use the rest for another batch of croustades or simply use it in the following day or so to make teriyaki salmon, chicken or beef for lunch or dinner. 12. 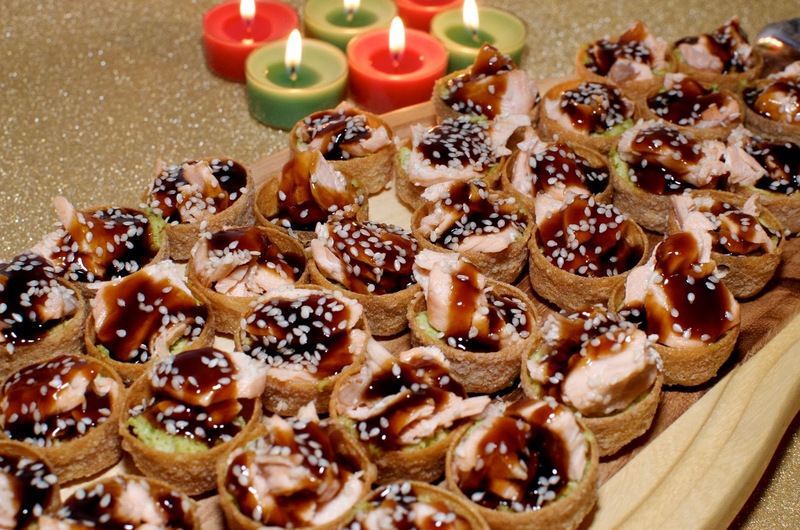 Finally, sprinkle the canapés with the toasted sesame seeds and place the croustades on a serving tray or board. 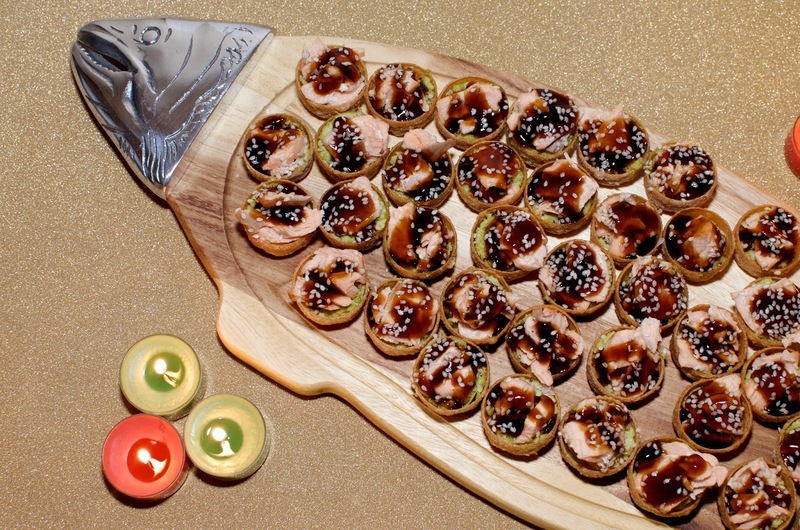 Top each canapé with a cashew or two. Add a tiny dollop of wasabi for an extra kick and a pop of green. Switch out the edamame purée for sushi rice. If you try this option, you could top each canapé with a whole cooked soya bean for a pop of green. Add 3 tablespoons of honey to your teriyaki sauce for extra sweetness. Add a green flourish by garnishing each croustade with pea shoots. Replace the salmon with cooked, shredded chicken tossed in the sauce for a Southern pulled pork feel as well as a different taste & texture. 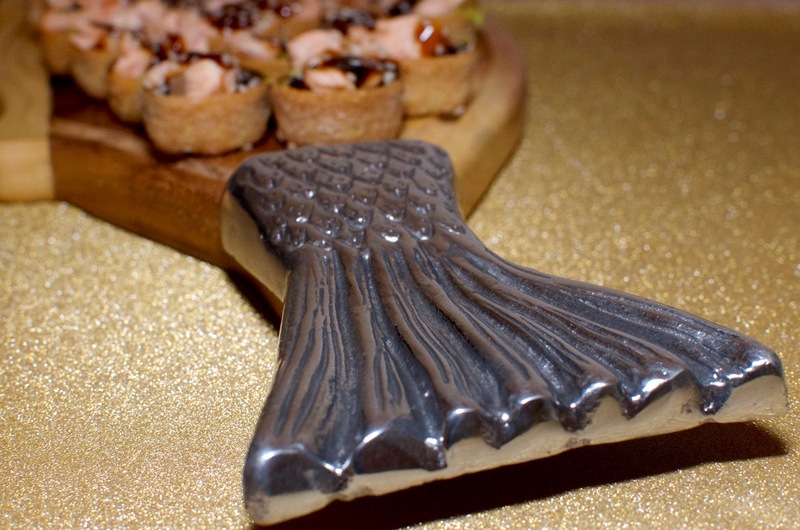 For more information on the Master Class Gourmet Prep & Serve Acacia Wood & Metal Fish Serving Board, visit kitchencraft.co.uk. Click here to shop this serving board from Amazon. I am a big fan of salmon and this might be a another great recipe to try.